10:30hrs: Drive through rich Kikuyu farmland to the edge of Rift Valley. Descend the escarpment and drive via Narok to Masai Mara Game Reserve. Lunch is served en-route. The Masai Mara adjoins Tanzanias Serengeti National Park. Masai Mara is famous for its black maned lion and yearly migrations of wildbeast and Zebra. Elephant, Buffalo, Rhino, Gazelle, Leopard, Giraffe are also found here. Game viewing is done en-route to the campsite/lodge. Dinner and overnight at the camp/lodge. A full day spent viewing and exploring this spectacular game reserve. All the Big Five can be seen. Masai Mara is also famous for its bird life. Meals and overnight at the camp/lodge. After breakfast leave the camp/lodge and proceed to Nakuru. Picnic lunch is served en-route. You will stop at Lake Elementaita to view flamingoes. 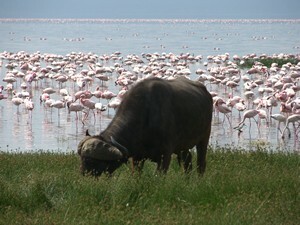 Lake Nakuru is famous for its pink Flamingoes and many other types of birds. There are also a number of animals in this park. Dinner and overnight at the Budget hotel/lodge. After breakfast spend the morning watching and photographing birds and wild animals in the park. Depart Nakuru after lunch and leave for Nairobi for panoramic views of the Great Rift Valley en-route. Arrive at Nairobi in the late afternoon.